I am a former Protestant minister. Like so many others who have trodden the path that leads to Rome by way of that country known as Protestantism, I never imagined I would one day convert to Catholicism. By temperament and training, I’m more of a pastor than a scholar, so the story of my conversion to the Catholic Church may lack the technical details in which theologians traffic and in which some readers delight. But I hope I will accurately explain why I did what I did, and why I believe with all my heart that all Protestants should do likewise. I won’t dwell on the details of my early years, except to say that I was raised by two loving parents in a nominally Protestant home. I went through most of the experiences that make up the childhood and adolescence of the typical American baby-boomer. I was taught to love Jesus and go to church on Sunday. I also managed to blunder into most of the dumb mistakes that other kids in my generation made. But after a season of teenage rebellion, when I was twenty years old, I experienced a radical reconversion to Jesus Christ. I turned away from the lures of the world and became serious about prayer and Bible study. As a young adult, I made a recommitment to Christ, accepting Him as my Lord and Savior, praying that He would help me fulfill the mission in life He had chosen for me. The more I sought through prayer and study to follow Jesus and conform my life to His will, the more I felt an aching sense of longing to devote my life entirely to serving Him. Gradually, just as dawn’s first faint rays peek over a dark horizon, the conviction began to grow that the Lord was calling me to be a minister. That conviction grew steadily stronger while I was in college and then afterward during my job as an engineer. Eventually I couldn’t ignore the call. I was convinced the Lord wanted me to become a minister, so I quit my job and enrolled in Gordon-Conwell Theological Seminary in suburban Boston. I acquired a Master of Divinity degree and was shortly thereafter ordained to the Protestant ministry. My six-year-old son, Jon-Marc, recently memorized the Cub Scouts’ oath, which says in part: “I … promise to do my best to do my duty to God and my country.” This earnest boyhood vow rather neatly sums up my own reasons for giving up a career in engineering in order to serve the Lord with complete abandon in fulltime ministry. I took my new pastoral duties seriously, and I wanted to perform them correctly and faithfully. Then, at the end of my life when I stood face-to-face with God, I could hear Him speak those all-important words: “Well done, good and faithful servant” (Mt 25:21). As I settled down into the rather pleasant life of a Protestant minister, I felt happy and at peace with myself and God — I finally felt that I had arrived. I soon found myself faced with a host of confusing theological and administrative questions. There were exegetical dilemmas over how to interpret difficult biblical passages correctly, as well as liturgical decisions that could easily divide a congregation. My seminary studies had not adequately prepared me to deal with this morass of options. I just wanted to be a good pastor. But I couldn’t find consistent answers to my questions from my fellow minister friends, nor from the “how to” books on my shelf, nor from the leaders of my Presbyterian denomination. It seemed that every pastor was expected to make up his own mind on these issues. We were taught in seminary to view the “triumph” of the Reformation over “Romanism” as Protestantism’s emancipation from Rome’s “manmade” laws and dogmas and customs that had “shackled” Christians for centuries. However, that “emancipation” began to look a lot more like anarchy than genuine freedom. I didn’t receive the answers I needed, even though I prayed constantly for guidance. I felt I had exhausted my resources and didn’t know where to turn. Ironically, this frustrating sense of being out of answers was providential. It set me up to be open to answers offered by the Catholic Church. I’m sure that if I had felt I had all the answers, I wouldn’t have been able or willing to investigate things at a deeper level. In the ancient world, cities were built on hilltops and ringed with stout walls that protected the inhabitants against invaders. When an invading army laid siege to a city (as when Nebuchadnezzar’s army surrounded Jerusalem in 2 Kings 25:1–7), the inhabitants were safe as long as their food and water held out and their walls could withstand the onslaught of the catapult’s missile and the sapper’s pick. But if the wall was breached, the city was lost. My willingness to consider the claims of the Catholic Church began as a result of a breach in the wall of the Reformed Protestant theology that encircled my soul. For nearly forty years I labored to construct that wall, stone by stone, to protect my Protestant convictions. The stones were formed from my personal experiences, seminary education, relationships, and successes and failures in the ministry. The mortar that cemented the stones in place was my Protestant faith and philosophy. My wall was high and thick and, I thought, impregnable. I became worried, however, as the mortar crumbled, and the stones began to shift and slide, at first imperceptibly but later on with an alarming rapidity. I tried hard to discern the reason for my growing lack of confidence in the doctrines of Protestantism. I wasn’t sure what I was seeking to replace my Calvinist beliefs. But I knew my theology was not invincible. I read more books and consulted with theologians in an effort to patch the wall, but I made no headway. I reflected often on Proverbs 3:5–6: “Trust in the Lord with all your heart, and do not rely on your own insight. In all your ways acknowledge Him, and He will make straight your paths.” This exhortation both haunted and consoled me as I grappled with the doctrinal confusion and procedural chaos within Protestantism. The Reformers had championed the notion of private interpretation of the Bible by the individual. I began to feel increasingly uncomfortable with that position in light of Proverbs 3:5–6. Bible-believing Protestants claim they do follow the teaching in this passage by seeking the Lord’s guidance. The problem is that Protestants feel the Lord is directing them to travel down thousands of different paths of doctrine. And these doctrines vary widely according to denomination. I struggled with several questions: How do I know what God’s will is for my life and for the people in my congregation? How can I be sure that what I’m preaching is correct? How do I know what truth is? In light of the doctrinal mayhem that exists within Protestantism — each denomination staking out for itself doctrine based on the interpretations of the man who founded it — the standard Protestant boast, “I believe only in what the Bible says,” began to ring hollow. I professed to look to the Bible alone to determine truth, but the Reformed doctrines I inherited from John Calvin, John Knox, and the Puritans clashed in many respects with those held by my Lutheran, Baptist, and Anglican friends. In the Gospels, Jesus explained what it means to be a true disciple (see Mt 19:16–23). It’s more than reading the Bible, or having your name on a church membership roster, or regularly attending Sunday services, or even praying a simple prayer of conversion to accept Jesus as Lord and Savior. These things, good though they are, by themselves do not make one a true disciple of Jesus. Being a disciple of Jesus Christ means making a radical commitment to love and obey the Lord in every word, action, and attitude, striving to radiate His love to others. The true disciple, Jesus said, is willing to give up everything, even his own life if necessary, to follow the Lord. I was deeply convinced of this fact. As I tried to put it into practice in my own life (not always with much success), I did my best to convince my congregation that this call to discipleship is not an option, but rather something for which Christians are called to strive. The irony was that my Protestant theology made me impotent to call them to radical discipleship, and it made them impotent to hear and heed the call. A newspaper reporter in New York City, so the story goes, wanted to write an article on what people consider the most amazing invention of the twentieth century. He hit the streets, interviewing people at random, and received a variety of answers: the airplane, the telephone, the automobile, the computer, nuclear energy, space travel, and antibiotics. The answers went on along these lines until one fellow gave an unlikely answer. “The thermos?” queried the reporter, eyebrows raised. Every Sunday I would stand in my pulpit and interpret Scripture for my flock, knowing that within a fifteen-mile radius of my church were dozens of other Protestant pastors. They all believed that the Bible alone is the sole authority for doctrine and practice, yet each was teaching something different from what I was teaching. Is my interpretation of Scripture the right one or not? I’d wonder. Maybe one of those other pastors is right, and I’m misleading these people who trust me. I also had the knowledge — no, the gut-twisting certitude — that one day I would die and stand before the Lord Jesus Christ, the Eternal Judge. I would be required to answer for how I led the people He had given me to pastor. I started questioning every aspect of my ministry and Reformed theology, from insignificant issues to important ones. I look back now with a certain embarrassed humor at how I fretted during those trying days of uncertainty. At one point, I even wrangled with doubts over whether to wear a clerical collar. Presbyterian ministers have no mandatory clerical dress code. Some wear collars, some business suits, some robes, and others a combination of all. One minister friend kept a clerical collar in the glove compartment of his car, just in case donning it might bring some advantage to him. “Like getting out of a speeding ticket,” he once confided with a conspiratorial grin. I decided not to wear a clerical collar. At Sunday services, I wore a plain black choir robe over my business suit. As for the form and content of Sunday liturgy, every church had its own views on how things should be done, and each pastor was free to do pretty much whatever he wanted within reason. Without mandated denominational guidelines to steer me, I did what all the other pastors were doing: I improvised. Hymns, sermons, Scripture selections, congregational participation, and the administration of baptism, marriage, and the Lord’s Supper were all fair game for experimentation. I shudder at the memory of one particular Sunday when, in an effort to make the youth service more interesting and “relevant,” I spoke the Lord’s words of consecration, ‘‘This is My body, this is My blood, do this in memory of Me,” over a pitcher of soda pop and a bowl of potato chips. I hesitated for a moment before giving my pat Presbyterian response. I considered the great diversity of alternative responses I could give, depending upon whether the inquirer were Methodist, Baptist, Lutheran, Assemblies of God, Nazarene, Christian Scientist, Foursquare Gospel, Jehovah’s Witnesses, or whatever. All I could do was mouth some sort of pious but vague “we must trust in the Lord” reassurance about her husband’s salvation. She may have been comforted, but her tearful plea tormented me. After all, as a Reformed pastor I believed Calvinistic doctrines of predestination and perseverance of the saints. This man had given his life to Christ; he had been regenerated and was confident that he was one of God’s elect. But was he? I was deeply unsettled by the knowledge that no matter how earnestly he may have thought he was predestined for heaven (it’s interesting that nearly all who preach the doctrine of predestination firmly believe they themselves are one of the elect), and no matter how sincerely those around him believed he was, he may not have gone to heaven. And what if he had secretly “backslidden” into serious sin and been living in a state of rebellion against God at the moment his heart attack caught him by surprise? Reformed theology told me that if that were the case, then the poor fellow had simply been deluded by a false security, thinking he was regenerated and predestined for heaven, when in fact he had not been regenerated all along and was on his way to hell. Calvin taught that the Lord’s elect will — they must — persevere in grace and election. If a person dies in a state of rebellion against God, he proves he never was one of the elect. What kind of absolute assurance is that? I wondered. I found it harder to give clear, confident answers to the “will my husband go to heaven?” kinds of questions my parishioners asked. Every Protestant pastor I knew had a different set of criteria that he listed as “necessary” for salvation. As a Calvinist, I believed that if one publicly accepts Jesus as his Lord and Savior, he is saved by grace through faith. But even as I consoled others with these fine-sounding words, I was troubled by the worldly and sometimes grossly sinful lifestyles these now-deceased members of my congregation had lived. After just a few years of ministry, I began to doubt whether I should continue. I rose one morning before dawn and, taking a folding chair, my journal, and a Bible, went out into a quiet field beside my church. It was the time of day I most love, when the birds are singing the world awake. I often marvel at the exuberance of birds in the early morning. What wonderfully short memories they have! They begin each day of their simple existence with a symphony of praise to the Lord who created them, utterly unconcerned with cares or plans. 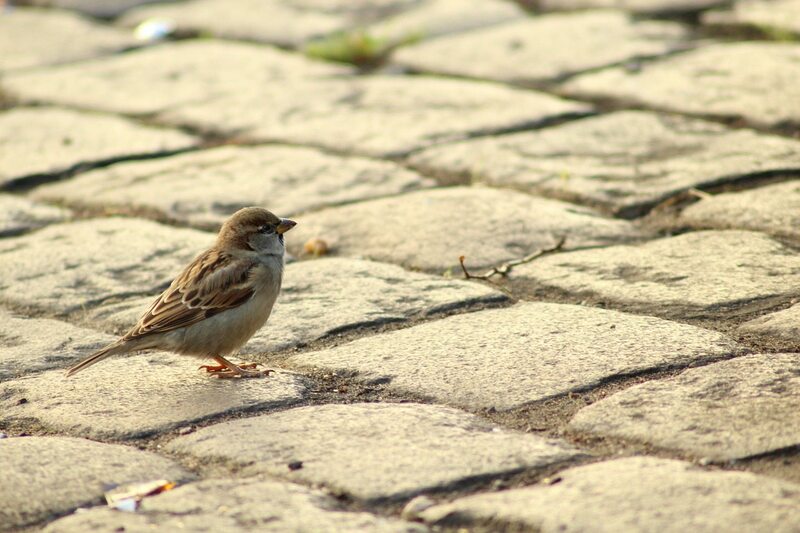 Sometimes, I’d “consider the sparrows” and meditate on the simplicity of their lives. Sitting quietly in the middle of the dew-covered field waiting for the sun to come up, I read Scripture and meditated on these questions that had been troubling me, placing my worries before the Lord. The Bible warned me not to “rely on [my] own insight,” so I was determined to trust in God to guide me. I was contemplating leaving the pastorate, and I saw three options. One was to become the leader of youth ministry at a large Presbyterian church that had offered me the position. Another was to leave ministry altogether and go back to engineering. The other possibility was to return to school and round out my scientific education in an area that would open even more doors to me professionally: I had been accepted into a graduate program in molecular biology at Ohio State University. I mulled over these options, asking God to guide my steps. An audible voice would be great, I thought, smiling, as I closed my eyes and waited for the Lord’s answer. I had no idea what form The Answer would take, but it was not long in coming. My reveries ended abruptly when a merrily chirping sparrow flew past and pooped on my head! “What are you saying to me, Lord?” I cried out with the anguish of Job. The trilling of the birds was the only response. There was no voice from heaven (not even a snicker), just the sounds of nature waking from its slumber in an Ohio cornfield. Was it a divine sign or merely Brother Bird’s editorial comment on my worries? In disgust, I folded my chair, grabbed my Bible, and went home. Although I’d have preferred a less humiliating method of communication, I knew that nothing occurs by accident, and that neither sparrows nor their droppings fall to earth without God’s knowledge. I took this as at least a comical hint from God to remain in the ministry. But I still knew my situation was not right. Maybe what I needed was a bigger church with a bigger budget and a bigger staff. Surely, then I’d be happy. So I struck off in the direction of the “bigger is better” church that I thought would satisfy my restless heart. Within six months, I found one I liked and whose very large congregation seemed to like me. They offered me the post of senior pastor, complete with an office staff and a budget ten times larger than the one I had at my previous church. Best of all, this was a strong Evangelical church with many members who were actively interested in Scripture study and lay ministry. I enjoyed preaching before this large and largely approving congregation each Sunday. At first, I thought I had solved the problem. But after only one month, I realized that bigger was not better. My frustration merely grew proportionately larger. Polite smiles beamed up at me during each sermon. But I wasn’t blind to the fact that for many in the congregation my passionate exhortations to live a virtuous life merely skittered across a veneer of religiosity like water droplets on a hot skillet. One day, I found myself standing before the local presbytery as spokesman for a group of pastors and laymen who were defending the idea that when we use parental language for God in communal prayer, we should call him “Father,” not “Mother” or “Parent.” I defended this position by appealing to Scripture and Christian tradition. To my dismay, I realized that the faction I represented was in the minority and that we were fighting a losing battle. This issue would be settled not by a well-reasoned appeal to Scripture or Church history, but by a vote — the majority of votes being pro-gender-neutral-language liberals. It was at this meeting that I first recognized the anarchistic principle that lies at the center of Protestantism. These liberals (grievously wrong in their scheme to reduce God to the mere functions of “creator, redeemer, and sanctifier” instead of the Persons of Father, Son, and Holy Spirit) were just being good Protestants. They were simply following the course of protest mapped out for them by their theological ancestors Martin Luther, John Calvin, and other Reformers. The Reformation maxim of “I will not abide by a teaching unless I believe it is correct and biblical” was being invoked by these liberal Protestants in favor of their protest against masculine names for God. All of a sudden, it hit me that I was observing Protestantism in the full solipsistic glory of its natural habit: protest. “What kind of church am I in?” I asked myself dejectedly as the vote was taken and my side lost. About this time my wife, Marilyn, who had been the director of a pro-life crisis pregnancy center, began challenging me to grapple with the inconsistency of our staunch pro-life convictions and the pro-choice stance of our Presbyterian denomination. “How can you be a minister in a denomination that sanctions the killing of unborn babies?” she asked. The denominational leadership had bowed under the pressure from radical feminist, homosexual, pro-abortion, and other extremist pressure groups within the denomination. Though, ostensibly, members of individual congregations could hold pro-life and other traditional views, they imposed stringent liberal guidelines on the hiring process for new pastors. When Marilyn woke me up to the fact that a portion of my congregation’s dues to the Presbyterian General Assembly were most likely paying for abortions — and there was nothing I or my congregation could do about it — I was stunned. Marilyn and I knew we had to leave the denomination, but where would we go? This question led to another: Where will I find a job as a minister? I purchased a book that listed the details of all major Christian denominations and began evaluating several of the denominations that interested me. I would read the doctrinal summaries and think, This one is nice, but I don’t like their view on Baptism. This one is OK, but their view of the end times is a bit too panic-ridden. This one sounds exactly like what I’m looking for, but I’m uncomfortable with their style of worship. After examining every possibility and not finding one that I liked, I shut the book in frustration. I knew I was leaving Presbyterianism, but I had no idea which denomination was the “right” one to join. There seemed to be something wrong with each of them. “Too bad I can’t customize my ‘perfect’ church,” I thought to myself wistfully. Around this time, a friend from Illinois called me on the phone. He, too, was a Presbyterian pastor and had heard through the grapevine that I was planning to leave the Presbyterian denomination. I could leave for another denomination, knowing that eventually I might move to another when I become dissatisfied; or I could decide to stay where I was and take my lumps. But then how could I justify staying where I was? Why shouldn’t I return to the previous denominational group we Presbyterians had defiantly broken away from? None of these options seemed right, so I decided that I would leave the ministry until I resolved the issue one way or the other. Returning to school seemed to be the easiest way to take a breather from all this, so I enrolled in a graduate program in molecular biology at Case Western Reserve University. My goal was to combine my scientific and theological backgrounds into a career in bioethics. I figured that a Ph.D. in molecular biology would win me a better hearing among scientists than would a degree in theology or ethics. The commute to the Cleveland campus took over an hour each way. So for the next eight months I had plenty of quiet time for introspection and prayer. Soon I was deeply immersed in a genetic engineering research project, which involved the removal and reproduction of human DNA taken from homogenized kidneys. The program was very challenging, but I loved it. Even so, compared to the complexities of amino acids and biochemical cycles, wrestling with Latin conjugations and German declensions suddenly seemed a lot easier. The project fascinated and frightened me. I relished the intellectual stimulation of scientific research. But I also saw how dehumanizing the research lab can be. Genetic tissue, harvested from the cadavers of deceased patients at the Cleveland Clinic, was sent to our lab for DNA research. I was deeply moved by the fact that this tissue had come from people — moms and dads, children, and grandparents who had once lived and worked and laughed and loved. In the lab, these neatly numbered vials of tissue were just tubes of “stuff,” experimental “material” that was utterly dissociated from the human person to whom it once belonged. I wrote an essay on the ethical problems involved with fetal tissue transplantation and began speaking to Christian groups about the dangers and blessings of modern biological technology. Things seemed to be going according to plan — at least until I realized that the real reason for my return to school was not to get a degree. It was so that I might buy a copy of the local Cleveland newspaper. One Friday morning, after a long drive into Cleveland, I was eating breakfast and killing time before class, trying to stay awake. Normally I’d squeeze in a little study time, but this morning I did something unusual: I bought a copy of The Plain Dealer. I choked on my coffee. “Catholic theologian Scott Hahn?” It couldn’t be the Scott Hahn I used to know. We had attended Gordon-Conwell Theological Seminary together back in the early eighties. Back then, he was a staunch Calvinist anti-Catholic, the staunchest on campus! I’d been on the fringe of an intense Calvinist study group that Scott led. But while Scott and others had spent long hours scouring the Bible like detectives, trying to uncover every angle of every theological implication, I had played basketball. Though I had not seen Scott since he graduated in 1982, I had heard the dark rumor floating around that he’d become Catholic. I hadn’t thought much about it. Either the rumor was false, contrived by someone who was offended by (or envious of) the intensity of Scott’s convictions, or else Scott had flipped. I decided to make the hour-and-a-half trip to find out. I was totally unprepared for what I discovered. I was nervous as I pulled into the parking lot of the huge Gothic structure. I had never been inside a Catholic church, and I didn’t know what to expect. I entered the church quickly, skirting the holy water fonts, and scuttled down the aisle, unsure of the correct protocol for getting into the pew. I knew Catholics bowed or curtsied or did some sort of jig-like obeisance toward the altar before entering the pew. But I just slipped in and scrunched down, hoping they wouldn’t recognize me as a Protestant. After a few minutes, when no grim-faced usher had tapped me on the shoulder and jerked his thumb back toward the door — “Come on, pal, hit the road; we know you’re not Catholic” — I began to relax. I gaped at the strange but undeniably beautiful interior of the church. A few moments later, Scott strode to the podium and began his talk with a prayer. When he made the sign of the cross, I knew he had truly jumped ship. My heart sank. Poor Scott, I thought, and groaned inwardly. The Catholics duped him with their clever arguments. As he spoke, using Scripture at each step to support Catholic teaching on the Mass and the Eucharist, I found myself mesmerized by what I heard. Scott was explaining Catholicism in a way I had never imagined possible: from the Bible! As he explained them, the Mass and the Eucharist were not offensive or foreign to me. At the end of his talk, when Scott issued a stirring call to a radical conversion to Christ, I wondered if maybe he had feigned conversion so he could infiltrate the Catholic Church to bring about renewal and conversion of spiritually dead Catholics. It didn’t take long before I found out. After the audience’s applause subsided, I went up front to see if he would recognize me. A throng of people with questions surrounded him. I stood a few feet away and studied his face as he spoke with his typical charm and conviction to the large knot of people. Yes, this was the same Scott I knew in seminary. He now sported a mustache and I a seasonal full beard (quite a change from our clean-cut seminary days). But when he turned in my direction, his eyes sparkled as he grinned a silent hello. In a moment, we stood together, our hands clasped in a warm handshake. He apologized if he had offended me in any way. “No, of course not!” I assured him as we laughed with the sheer delight of seeing each other again. Scott gave me a brief explanation of his struggle to find the truth about Catholicism. The throng of people around us listened intently to his mini-conversion story. He suggested I pick up a copy of his conversion story tape, which the throng was snapping up in the vestibule. We exchanged phone numbers and shook hands again, and I headed for the back of the church. I found a table covered with tapes on the Catholic faith by Scott and his wife, Kimberly, as well as tapes by Steve Wood, another convert to Catholicism who had studied at Gordon-Conwell Theological Seminary. I bought a copy of each tape and a copy of a book Scott had recommended, Karl Keating’s Catholicism and Fundamentalism. Before I left, I stood in the back of the church, taking in for a moment the strange yet attractive hallmarks of Catholicism: icons and statues, ornate altar, candles, dark confessional booths. I stood there for a moment wondering why God had called me to this place. Then I stepped into the cold night air, my head dizzy with thought and my heart flooded with a confusing jumble of emotions. I went to a fast-food restaurant, got a burger for the drive home, and slipped Scott’s conversion tape into the player. I presumed I would easily discover where he had gone wrong. Before I was halfway home, however, I had become so overwhelmed with emotion that I had to pull off the highway to clear my head. Even though Scott’s journey to the Catholic Church was very different from the one I myself was unknowingly making, the questions he and I grappled with were essentially the same — and the answers he found, which had so drastically changed his life, were very compelling. His testimony convinced me that the reasons for my growing dissatisfaction with Protestantism could not be ignored. The answers to my questions, he claimed, were to be found in the Catholic Church. The idea pierced me to the core. I was at once frightened and exhilarated by the thought that God might be calling me into the Catholic Church. I prayed for a while, my head resting on the steering wheel, and collected my thoughts before I started the car again and drove home. The next day, I opened Catholicism and Fundamentalism and read straight through, finishing the final chapter that night. As I prepared to retire for the night, I knew I was in trouble! It was clear to me now that the two central dogmas of the Protestant Reformation, sola Scriptura (Scripture alone) and sola fide (justification by faith alone), were on very shaky biblical ground, and therefore so was I. My appetite thus whetted, I began reading Catholic books, especially by the early Church Fathers. Their writings helped me understand the truth about Catholic history before the Reformation. I spent countless hours debating with Catholics and Protestants, doing my best to subject Catholic claims to the toughest biblical arguments I could find. Marilyn, as you might guess, was not pleased when I told her about my struggle with the claims of the Catholic Church. Although at first she told me, “This too will pass,” eventually the things I was learning began intriguing her, too. So she began studying for herself. As I waded through book after book, I shared with her the clear and common sense teachings of the Catholic Church I was discovering. More often than not, we would conclude together how much more sense and how much truer to Scripture the views of the Catholic Church seemed than anything we had found in the wide range of Protestant opinions. There was depth, historical strength, a philosophical consistency to the Catholic positions we encountered. The Lord worked an amazing transformation in both our lives, coaxing us along, side by side, step by step, together all the way. With all these good things we were finding in the Catholic Church, however, we were also confronted by some confusing and disturbing issues. I encountered priests who thought me strange for considering the Catholic Church. They felt that conversion was unnecessary. We met Catholics who knew little about their faith and whose lifestyles conflicted with the moral teachings of their Church. When we attended Masses, we found ourselves unwelcomed and unassisted by anyone. Nonetheless, in spite of these obstacles blocking our path to the Church, we kept studying and praying for the Lord’s guidance. After listening to dozens of tapes and digesting several dozen books, I knew I could no longer remain a Protestant. It had become clear that the Protestant answer to church renewal was, of all things, unscriptural. Jesus had prayed for unity among His followers, and the Apostles Paul and John had both challenged their followers to hold fast to the truth they had received, not letting opinions divide them. As Protestants, however, we had become infatuated with our freedom, placing personal opinion over the teaching authority of the Church. We believed that the guidance of the Holy Spirit was enough to lead any sincere seeker to the true meaning of Scripture. The Catholic response to this view is that it is the mission of the Church to teach with infallible certitude. Christ promised the Apostles and their successors: “He who listens to you listens to Me. And he who rejects you rejects Me and rejects the one who sent Me” (Lk 10:16). I studied the causes for the Reformation. The Catholic Church of that day was truly in need of renewal, but Martin Luther and the other Reformers chose the wrong, the unbiblical, method for dealing with the problems they saw in the Church. The correct route was and still is just what my Presbyterian friend had told me: Don’t leave the Church; don’t break the unity of faith. Work for genuine reform based on God’s plan, not man’s, achieving it through prayer, penance, and good example. I could no longer remain Protestant. To do so meant I must deny Christ’s promise to guide and protect His Church and to send the Holy Spirit to lead it into all truth. (See Mt 16:18–19, 18:18, 28:20; Jn 14:16, 25, 16:13.) But I couldn’t bear the thought of becoming a Catholic. I’d been taught for so long to despise “Romanism” that, even though intellectually I had discovered Catholicism to be true, I had a hard time shaking my emotional prejudice against the Church. One key difficulty was the psychological adjustment to the complexity of Catholic theology. By contrast, my form of Protestantism was simple: Admit you’re a sinner, repent of your sins, accept Jesus as your personal Savior, trust in Him to forgive you, and you’re saved. I continued studying Scripture and Catholic books and spent many hours debating with Protestant friends and colleagues over difficult issues such as Mary, praying to the saints, indulgences, purgatory, priestly celibacy, and the Eucharist. Eventually I realized that the single most important issue was authority. All of this wrangling over how to interpret Scripture gets one nowhere if there is no way to know with infallible certitude that one’s interpretation is the right one. The teaching authority of the Church in the Magisterium centered on the seat of Peter. If I could accept this doctrine, I knew I could trust the Church on everything else. I read Father Stanley Jaki’s And on This Rock and The Keys to the Kingdom, as well as the documents of Vatican II and earlier councils, especially Trent. I carefully studied Scripture and the writings of Calvin, Luther, and the other Reformers to test the Catholic argument. Time after time, I found that the Protestant arguments against the primacy of Peter simply were not biblical or historical. It became clear that the Catholic position was the biblical one. The Holy Spirit delivered a literal coup de grâce to my remaining anti-Catholic biases when I read Blessed John Henry Newman’s landmark book An Essay on the Development of Christian Doctrine. In fact, my objections evaporated when I read a passage in the middle of this book. Here Newman explains the gradual development of papal authority this way: “ It is a less difficulty that the Papal supremacy was not formally acknowledged in the second century, than that there was no formal acknowledgment on the part of the Church of the doctrine of the Holy Trinity till the fourth. No doctrine is defined till violated” (4, 3, 4). My study of Catholic claims took about a year and a half. During this period, Marilyn and I studied together, sharing as a couple the fears, hopes, and challenges that accompanied us along the path to Rome. We attended Mass weekly, making the drive to a parish far enough away (my former Presbyterian Church was less than a mile from our home) to avoid the controversy and confusion that would undoubtedly arise if my former parishioners knew that I was investigating Rome. We gradually began to feel comfortable doing all the things Catholics did at Mass (except receiving Communion, of course). Doctrinally, emotionally, and spiritually, we felt ready to enter the Church formally. There remained, however, one barrier for us to surmount. Before Marilyn and I met and fell in love, she had been divorced after a brief marriage. Since we were Protestants when we met and married, this posed no problem, as far as we and our denomination were concerned. It wasn’t until we felt we were ready to enter the Catholic Church that we were informed that we couldn’t unless Marilyn received an annulment of her first marriage. At first, we felt as if God was playing a joke on us! Then we moved from shock to anger. It seemed so unfair and ridiculously hypocritical: We could have committed almost any other sin, no matter how heinous, and with one confession been adequately cleansed for Church admission. But because of this one mistake, our entry into the Catholic Church had been stopped dead in the water. But then we remembered what had brought us to this point in our spiritual pilgrimage: We were to trust God with all our hearts and lean not on our own understanding. We were to acknowledge Him and trust that He would direct our paths. It became evident that this was a final test of perseverance sent by God. So Marilyn began the difficult annulment investigation process, and we waited. We continued attending Mass, remaining seated in the pew, our hearts aching while those around us went forward to receive the Lord in the Holy Eucharist. By not being able to receive the Eucharist, we learned to appreciate the awesome privilege that Jesus bestows on His beloved of receiving Him, Body and Blood, Soul and Divinity, in the Blessed Sacrament. The Lord’s promise in Scripture became real to us during those Masses: “The Lord disciplines him whom He loves” (Heb 12:6). After a nine-month wait, we learned that Marilyn’s annulment had been granted. Without further delay, our marriage was blessed, and we were received with great excitement and celebration into the Catholic Church. It felt so incredibly good finally to be home where we belonged. I wept quiet tears of joy and gratitude that first Mass when I was able to walk forward with the rest of my Catholic brothers and sisters to receive Jesus in Holy Communion. I had asked the Lord many times in prayer, “What is truth?” He answered me in Scripture by saying, “I am the Way, the Truth, and the Life.” I rejoice that now as a Catholic I not only can know the Truth but can also receive Him in the Eucharist. I think it is important to mention one more of Blessed John Henry Newman’s insights that made a crucial difference in the process of my conversion to the Catholic Church. He once famously observed: “To be deep in history is to cease to be a Protestant.” This one line summarizes a key reason why I abandoned Protestantism, bypassed the Eastern Orthodox Churches, and became Catholic. Newman was right. The more I read Church history and Scripture the less I could comfortably remain Protestant. I saw that it was the Catholic Church that was established by Jesus Christ, and all the other claimants to the title “true church” had to step aside. It was the Bible and Church history that made a Catholic out of me, against my will (at least at first) and to my immense surprise. I also learned that the flip side of Newman’s adage is equally true: To cease to be deep in history is to become a Protestant. That’s why we Catholics must know why we believe what the Church teaches as well as the history behind these truths of our salvation. We must ready ourselves and our children so that we can “always be prepared to make a defense to any one who calls [us] to account for the hope that is in [us]” (1 Pt 3:15). By boldly living and proclaiming our faith, many will hear Christ speaking through us and will be brought to a knowledge of the truth in all its fullness in the Catholic Church. God bless you on your own journey of faith! Marcus received his BS degree from Case Institute of Technology in Polymer Engineering and worked for six years as an engineer. During this time, he was involved in a variety of Protestant youth and music ministries. He then received his Master of Divinity Degree from Gordon-Conwell Theological Seminary and was ordained to the Protestant pastoral ministry. During his more than fifteen years of youth, young adult, and pastoral ministry, his main emphasis was church and lay spiritual renewal. Marcus, his wife Marilyn, and their two older sons, JonMarc and Peter, were received into the Catholic Church on December 20, 1992. Their third son, Richard, entered through baptism. 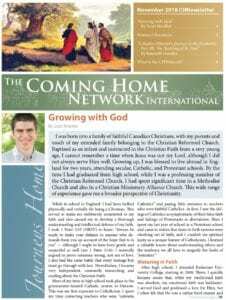 Marcus now serves as the Founder / President of The Coming Home Network International, a non-profit, Catholic, lay apostolate aimed at helping other Christians, both clergy and laity, explore the Catholic Church. He also hosts The Journey Home, a weekly live television program, and Deep In Scripture, a weekly live radio program, both on EWTN. He is the author of Thoughts for the Journey Home, What Must I Do to Be Saved?, the novels How Firm a Foundation and Pillar and Bulwark, and the editor/author of Journeys Home and Journeys Home II. He has taught courses in catechetics, youth ministry, leadership, and theology at Franciscan University of Steubenville and the Pontifical College Josephinum. He has written regular articles for Catholic Answers Magazine, as well as other Catholic publications.